Extreme speed on display, with two of the premier big racing schooners of the 19th Century American East, Commodore W.H. Thomas’s RAMBLER leading Jacob B. Voorhies’ MADELEINE in a head-to-head match on Sept. 19, 1872. The two classic schooners set out from Brenton Reef Lightship, voyaged round Sandy Hook Lightship and return to the Newport, Rhode Island coast. The match was won by RAMBLER almost four hours ahead of MADELEINE at the finish 43 hours, 25 minutes, 32 seconds later. A rare painting of the earliest days of yacht racing, this is more so since it is the earliest identified and extremely rare oil painting by the noted watercolor artist and illustrator Cozzens. The sharp parallel lines and racing trim of both yachts is in keeping with the early works of his noted peer Antonio Jacobsen, both artists building upon the foundation of great American yachting works by James E. Buttersworth. Dated 1872, the schooners achieved fame over a span of years. MADELEINE launched as a sloop in 1868, built by David Kirby of Rye, New York. She would be altered to a schooner in 1870, and modified in 1871, 1873 and 1875 until she earned the reputation as the fastest American yacht in 1876 and successfully defended the America’ Cup from Lord Dunraven’s challenger, COUNTESS OF DUFFERIN. 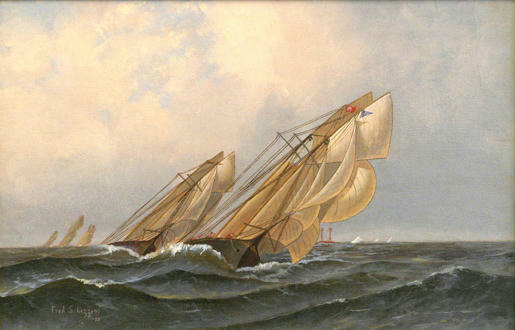 RAMBLER was part of the fleet defense of the Auld Mug in 1870, and soundly beat MADELEINE twice in 1872. Thomas sold the yacht in the late 1880s and she was used to sail 60 tons of dynamite under the command of Captain John “Dynamite” O’Brien to Panama in 1888. Leisure, speed and glory would be both of theirs. Born in Livingston, Staten Island, New York in 1846, Cozzens became one of the era's better known sea painters recognized primarily for his early depictions of the fledgling New York Yacht Club racing events. He was also noted for his portrayal of naval events and maneuvers. In his superior renderings of famous yachts, he was usually commissioned directly by the owners of the vessels. He illustrated for publications such as Harper's Bazaar, The Daily Graphic, Yachts and Yachting, Our Navy and others. His widely received edition of lithographs, American Yachts, was published in 1884(these prints are highly sought after today.) Early in his career Cozzens became devoted to depicting the America's Cup races and various yachting competitions of the New York Yacht Club. A monograph on his work was published in 1982. In his day, he had numerous successful exhibitions in New York, Boston and Philadelphia.